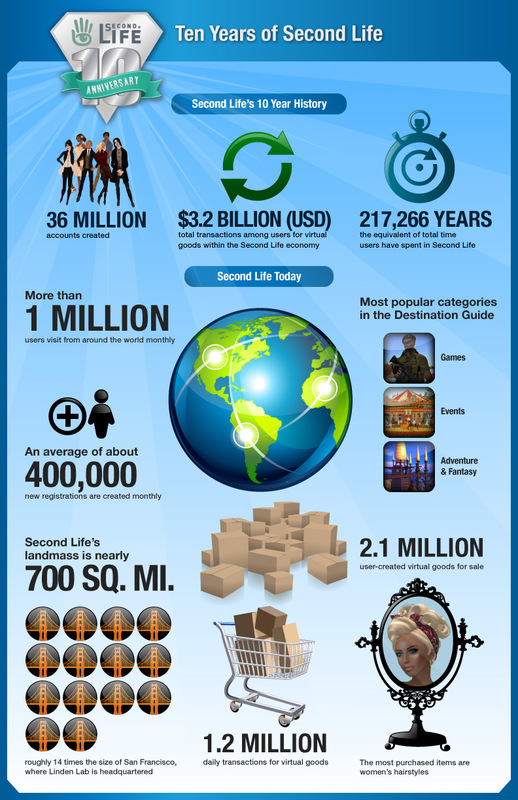 What is Second Life® ? Second Life® is a 3-D virtual world entirely built and owned by its residents. Since opening to the public in 2003, it has grown explosively and today is inhabited by a total of more than 36,000,000 people from around the globe. From the moment you enter ‘the World’ you’ll discover a vast digital continent, teeming with people, entertainment, experiences and opportunity. Once you’ve explored a bit, perhaps you’ll find a perfect parcel of land to build your house or business. You’ll also be surrounded by ‘the Creations’ of your fellow residents. Because residents retain the rights to their digital creations, they can buy, sell and trade with other residents. ‘The Marketplace’ currently supports millions of US dollars in monthly transactions. This commerce is handled with the in-world unit-of-trade, the Linden dollar, which can be converted to US dollars at several thriving online Linden Dollar exchanges. We look forward to seeing you in-world.